From center, Director of the Department of Science Technology and Environment of the Ministry of Construction Lê Trung Thành (blue tie), USAID Vietnam Mission Director Michael Greene (blue patterned tie) and Chief of Party Vu Thi Kim Thoa. Deputy Chief of Party Firras Traish, Winrock's Clean Energy Innovation Lead Bikash Pandey and USAID Vietnam’s Environmental Officer Scott Bartos are third, fourth and sixth from right. Winrock project launches first Green Growth Action Plan in construction sector. On June 16, the USAID Vietnam Clean Energy Program, implemented by Winrock International, launched the first Green Growth Action Plan (GGAP) for the Vietnam construction sector. Developed jointly with the Vietnam Ministry of Construction and officially approved last month, GGAP aims to strengthen the foundation for low-emissions energy systems in Vietnam’s construction sector. GGAP makes use of the Vietnam Clean Energy Program’s building energy performance data, study findings on CO2 emission baseline and reduction projections, and technological reviews to achieve targets specified in Vietnam’s National Strategy on Green Growth to 2020, vision to 2030 plan. 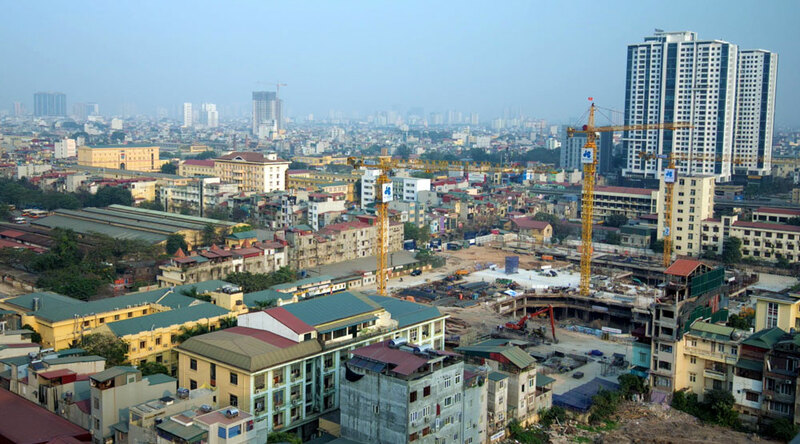 The Green Growth Action Plan aims to strengthen the foundation for low-emissions energy systems in Vietnam’s construction sector. One of the program’s objectives is to enhance the capacity to acquire, analyze and manage building energy sector data in decision-making, especially in implementing the Vietnam Energy Efficiency Building Code. It does this in part through training courses in integrated design, building energy simulation and the incorporation of energy code requirements into construction processes. So far, 3,000 Vietnamese architects, engineers, project managers, government officials and practitioners have benefited from these courses. “The program offers building owners free technical support to provide building energy simulations that can help them achieve substantial energy and greenhouse gas reductions for their newly designed and retrofitted building demonstration projects,” said USAID Vietnam Mission Director Michael Greene at the launch. Vietnam has one of the world’s fastest rates of urbanization, he noted, which underlines the need to integrate the Vietnam Energy Efficiency Building Code into the building sector’s action plan for green growth. Vietnam has one of the world’s fastest rates of urbanization. The Green Growth Action Plan will reduce greenhouse gas emissions 8 to 10 percent by 2020 and reduce energy consumption by 1 to 1.5 percent each year. Lê Trung Thành, director of the Department of Science Technology and Environment of the Ministry of Construction, discussed such side effects of economic development as pollution and resource exhaustion. Vietnam is one of the countries that suffers most from rising sea levels, drought, floods and other effects of climate change, he said. In fact, it was these changes that prompted the government to prepare a national action plan for green growth. The USAID Vietnam Clean Energy Program and the Ministry of Construction engaged ministerial agencies and research institutions in policy review to develop GGAP, which covers all three climate zones in Vietnam. It will reduce greenhouse gas emissions 8 to 10 percent by 2020 and reduce energy consumption by 1 to 1.5 percent each year. Following the GGAP launch, the ministry will help decision-makers in the building sector take advantage of available analyses and provide a framework to address clean energy policy issues. The GGAP will also promote green building, green building materials, energy simulations and new building technologies. In addition to launching GGAP, the five-year Vietnam Clean Energy Program, which concluded this month, developed a building energy use baseline and established the first comprehensive Building Energy Performance Database, which will store and manage comprehensive building energy use data throughout Vietnam. The program also offered new energy simulation technologies for five local buildings during the design and early construction phase, which reduced the total energy cost by 22 to 45.5 percent — and CO2 emissions by 1,000 tons a year. Present at the conclusion ceremony first row, left to right: Nguyen Thanh Xuyen, Ho Chi Minh City Department of Construction (HCMC DOC); Nguyen Cong Thinh, Ministry of Construction Department of Science – Technology and Environment, (MOC DSTE); Nguyen Huy Khanh, Vietnam National Construction Consultants Corporation (VNCC); Dr. Pham Khanh Toan, Ministry of Construction International Cooperation Department (MOC ICD); Phan Thi My Linh, Vice Minister, MOC; Michael Greene, USAID Vietnam, Mission Director; Amit Bandopadhyaya, Winrock International; Vu Thi Kim Thoa, Winrock International; La Thi Kim Ngan, Vietnam Architect Association (VAA); Pham Hong Hanh, Winrock International; Le Nguyen Minh, National University of Civil Engineering (NUCE). Second row, left to right: Nguyen Kim Ngan, Winrock International; Tran Ngoc Quang, NUCE; Tran Thanh Vu, Winrock International; Nguyen Thanh Binh, HCMC DOC; Dinh Chinh Loi, MOC DSTE; Do Duc Tuong, USAID Vietnam; Firras Traish, Winrock International; Do Binh Yen, Institute for Energy Science, Vietnam Academy of Science and Technology (IES); Dr. Tran Thanh Lien, Independent Energy Expert; Dr. Dang Vu Tung, Winrock International; Scott Bartos, USAID Vietnam.